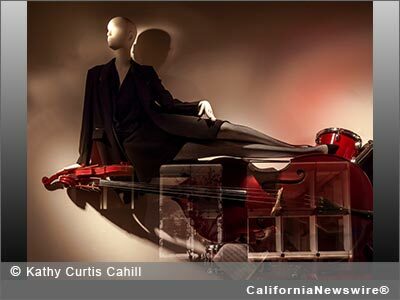 LOS ANGELES, Calif. /California Newswire/ — Calumet Gallery today announced the upcoming opening of a new fine art photography exhibit, "Night Echoes" (January 3 – February 3, 2014, 9 a.m.- 6 p.m. M-S), a thematic exhibition from photographer Kathy Curtis Cahill. Calumet will host an Open to the Public wine and cheese Artists Reception on January 9, from 6 – 8:30 p.m., with an artist talk at 7 p.m.
"Night Echoes" is an exhibit of 16 color prints of posed mannequins in storefront sets, dressed and designed to induce and seduce us to purchase garments. These large-scale prints are texturally captivating in and of themselves, but the role of an artist is often to dismantle the existing communication codes and reassemble some of them to present the world with new views and thematic novellas. While the fashion and storefront designers have constructed garments and a presentation that pushes the boundaries of institutional art, Cahill presents work that is at odds with the structure of art culture at large. Her photographic viewpoint transcends the documentary pictures of seductive storefronts by positioning the viewer inductively. You are on the outside looking in, sometimes on the inside looking out, but you are not window-shopping as one does during the day; you are 'window wondering' in the loneliness of the night, your personal quiet mirrored in glassy echoes. Educated as an art teacher in New York State, Kathy's move to Los Angeles led her to switch occupations to set decorating for film and television on hit shows such as "Criminal Minds," "Judging Amy," and many others. In college, she learned photography, kept her interest alive with continued shooting, and processed her own B&W darkroom. Full time employment in television brought digital photography into play as a work tool to record sets and locations, and eventually, what originally was a tool, became a workflow to add photographic images to the sets with a personal touch. When asked about the how and the why of her work, Cahill says, "Night intrigues me because it alters our perceptions of daylight reality. City night is a mix of dark and man-lit selections, wherein the dark, undefined shapes echo the fears we have of the unseen and the unknowable, against the selectively lit areas. My adult life is largely a city life and I love to walk the familiar streets of day and compare how they take on a different life at night. Sunlit streets have crisp, stark shadows, with edgy sometimes blinding highlights, but at night, the judicious placement of lights create pools of feathered highlights, that draw our attention to what the light user deemed as significant." "I continue to capture store windows and city night scenes, but I don't always know what I have until I study them on my computer," says Kathy. "Often, I am surprised at how many hidden meanings reveal themselves, and the subtext that creates even finer themes to study. I love this medium, which is essentially about what light reveals and shadow conceals." Sabrina Valdez, manager of Calumet Gallery, said of Cahill's work, "Kathy's exhibit is emblematic of our outreach efforts to find and present photographers with visual voices that matter. Her work is indicative of the depth and breadth of photography exhibits that Calumet presents, and we invite the public to explore this exciting work and to meet Kathy Curtis Cahill at our reception." Calumet Photographic, 1135 N. Highland Ave., Hollywood, CA 90038; Ph: 323.466.1238. Image Caption: "Curvature" Copr. (c) Kathy Curtis Cahill – all rights reserved.